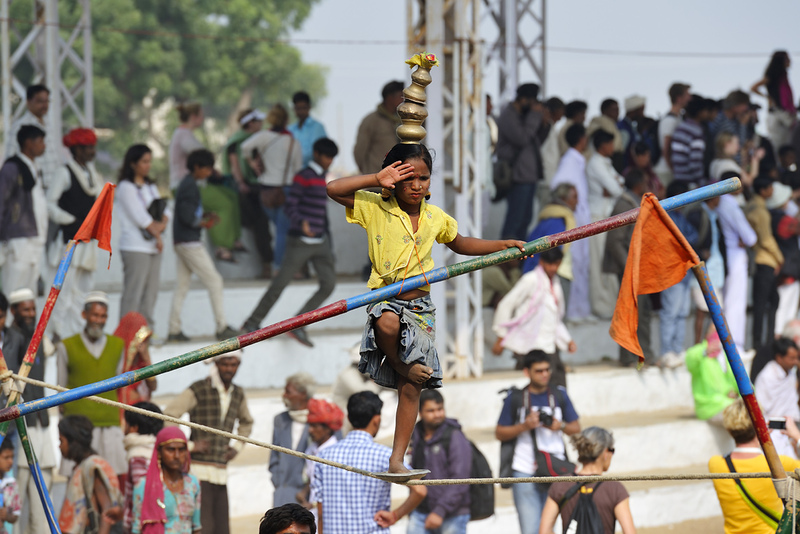 Tip: All photos of the reportage can be viewed in a bigger size in a new browser window by clicking on the picture. In the dark I can hear noises coming from afar, especially the low, rumbling growls emitted intermittently by the camels, though the sounds are somewhat muffled because of the distance. 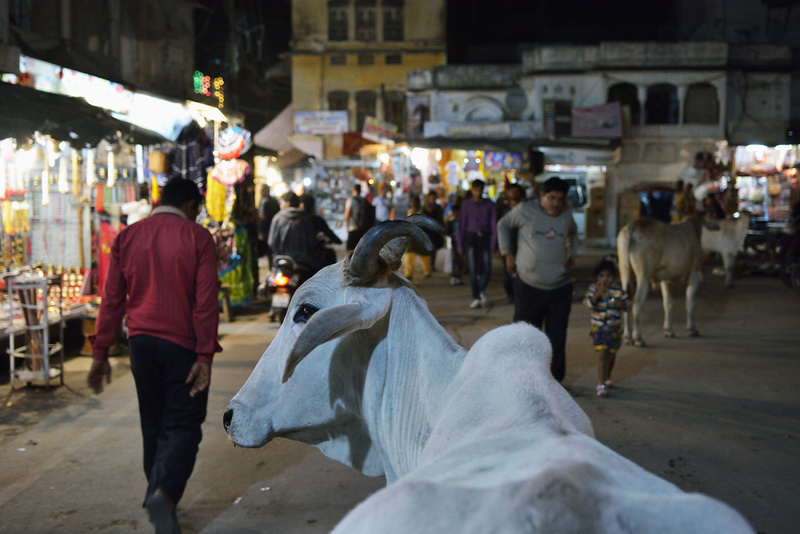 The tension mounts, as I walk, hours before sunrise, the long 1.5 kilometer stretch towards the largest camel fair in the world. 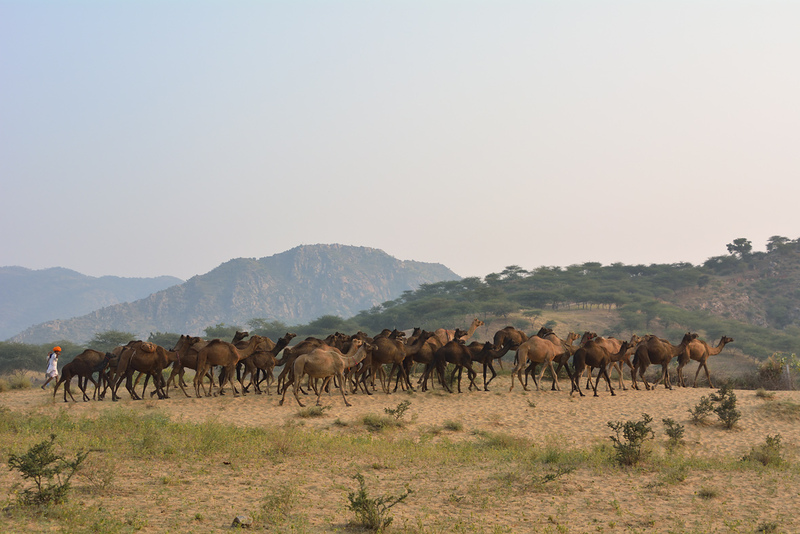 Eventually I am able to discern the still-faint outlines of the first tents and camels; a barely-there fence lets me enter directly into the camel camp from the dirt road. 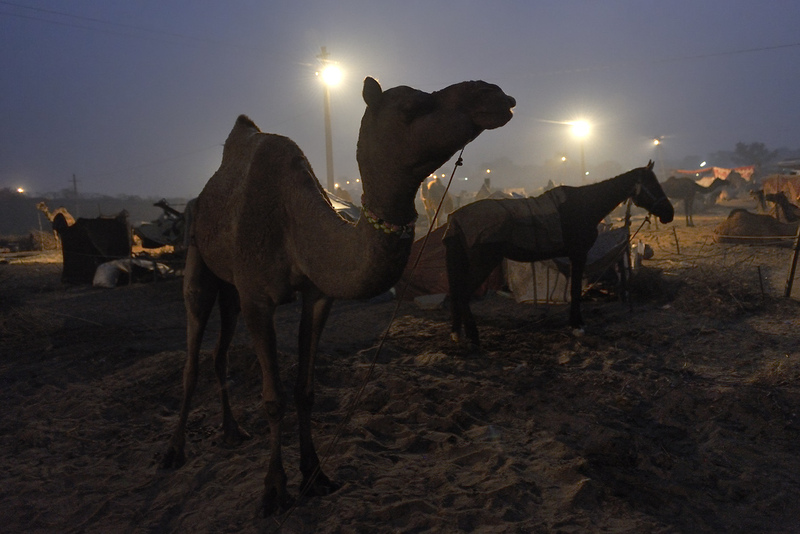 In the distance a few night lamps illuminate the night, but here at the edge of the camp, it is still pitchdark. 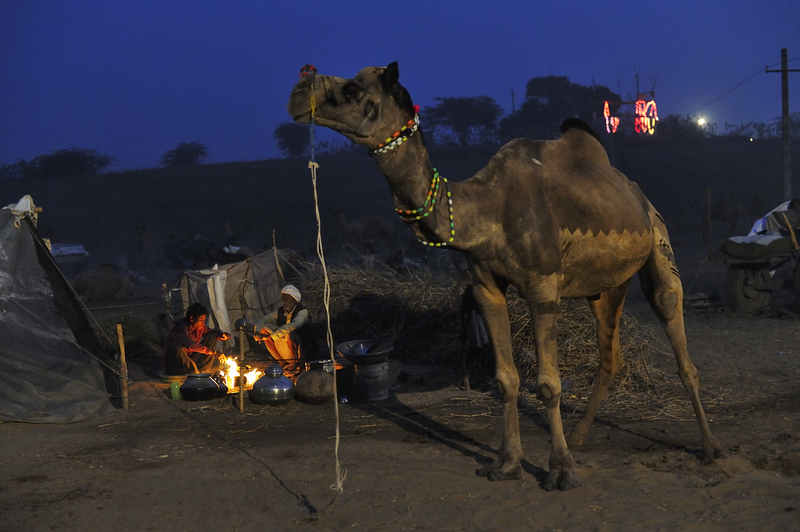 Fortunately I had packed in a small travel flashlight, because who wants to stumble over a sleeping camel? Still, I feel very strange, somehow out of place, I know neither the surroundings, nor do I, as a city rat, have the slightest idea about camels! Do they bite? Or do they snap at you or perhaps they kick out, like horses? So I better just walk around the animals once keeping a safe distance. It is 5.30 am and most of the campers are still sleeping, but one or the other is already clanging his metal pans, fetching water at the fountain, emerging from the bushes and a campfire is already burning. Suddenly I am standing before my first camel! 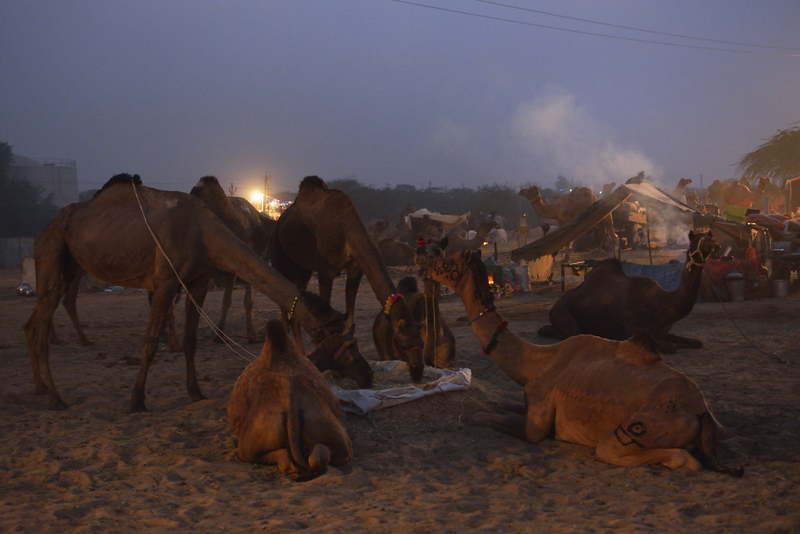 So I get my Nikon out of my bag, turn up the ISO speed, and simply take a first test photo – after all, it was specially for the camel fair that I had undertaken the long journey all this way. The battery is full, the memory cards newly formatted – let's get started! 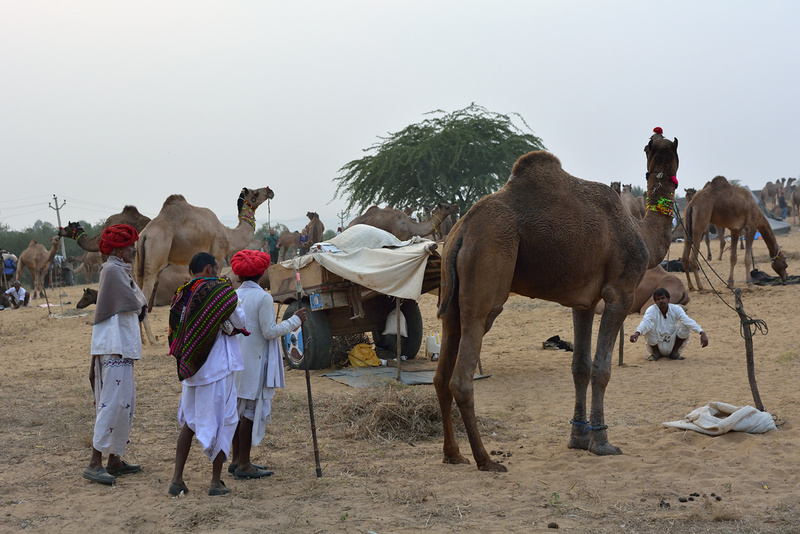 The Pushkar Festival is actually a combination of two seemingly completely different events. 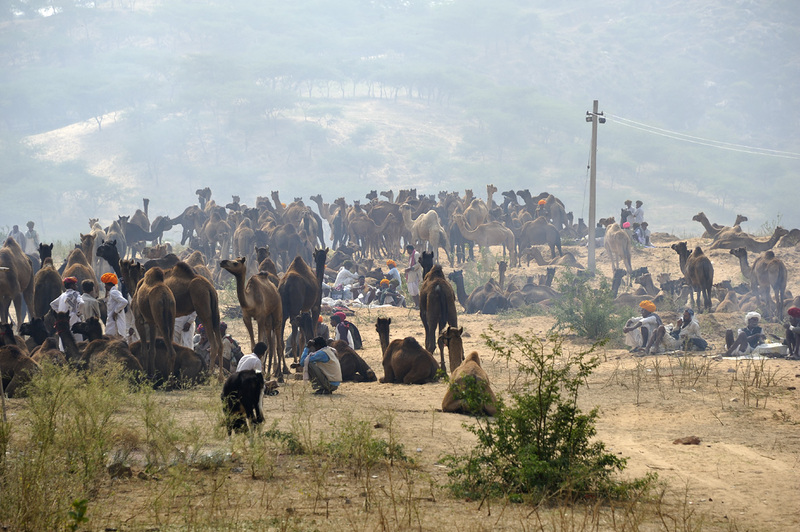 It begins with the Pushkar Camel Fair (or Pushkar Mela), the largest camel market in the world, the actual purpose of my trip, and then merges into the Pushkar Puja, one of the most religious celebrations, in honor of the Hindu god Brahma, the Lord of creation. 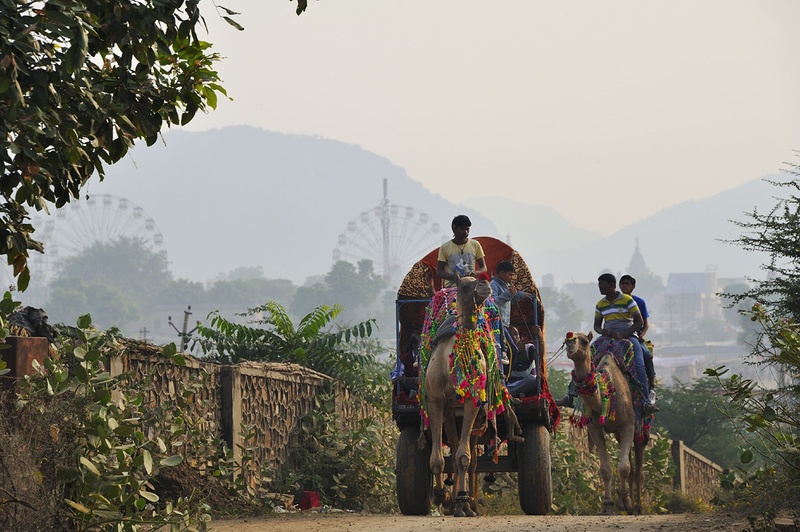 In November each year, Pushkar, the otherwise sleepy nest of 20,000 inhabitants in the north-Indian state of Rajasthan comes to life, and then during the camel fair and the Pushkar Puja, or the "Festival of Kartik Purnima", it is practically bursting from the seams. Kartika Purnima is a sacred festival for Hindus, Jains and Sikhs, which takes place at full moon (= Purnima) in the month October or November (= Kartika), depending on the moon's position. 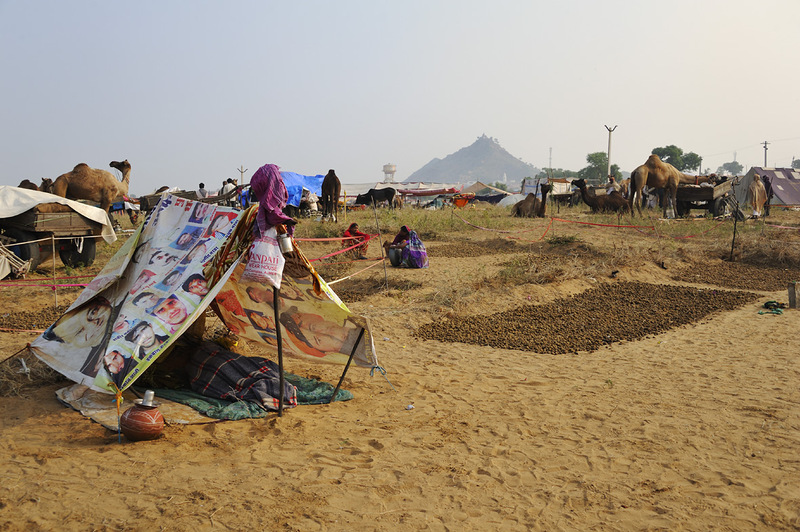 Pushkar's hotel capacity falls short many times over and to accomodate the many pilgrims and visitors, large tents in all possible standards, from luxury camps with warm, running water to plank-bed collective tents with common toilets, are set up around the city. 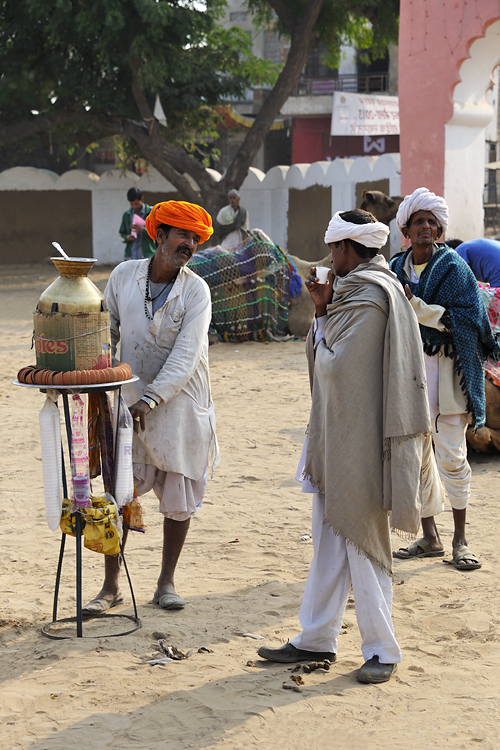 Pushkar is regarded as one of the oldest Indian cities ever and since time immemorial, it has attracted people from all over to its festival – this makes the Pushkar festival one of the oldest "continuous gatherings" in the history of mankind – wow! The existence of the city – and the festival – find mention in two of the oldest Hindu epics, the "Ramayana" and "Mahabharata" dating from the 4th Century BC. 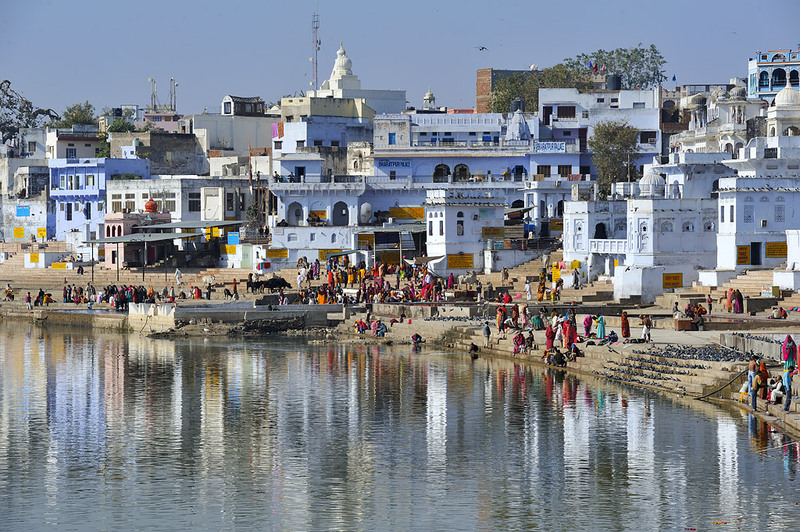 The mythology of the Hindu creator-god Brahma describes the origin of Pushkar Lake: As a demon killed Brahma's children, he struck him with his weapon, the lotus flower. The lotus leaves fell on three different parts of the world. 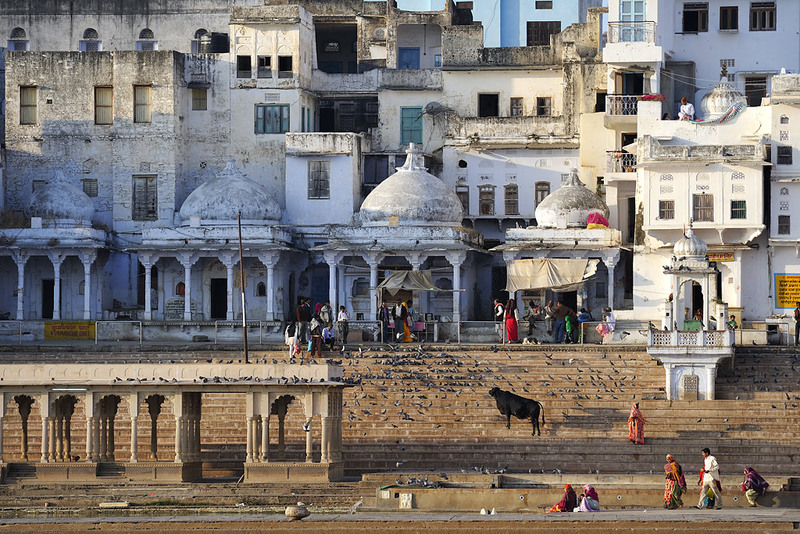 One of them was Pushkar, where, at this point, arose a lake. Brahma is said to have then offered a sacrifice on this lake, under a full moon in the month of Kartik, to bless the place. 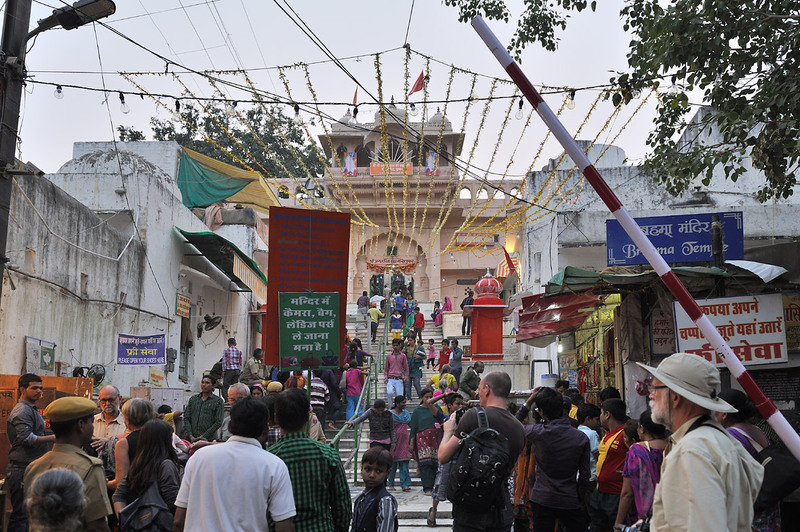 So in return, the city of Pushkar dedicated "their" god Brahma, a great temple, the only one of its kind in the world. 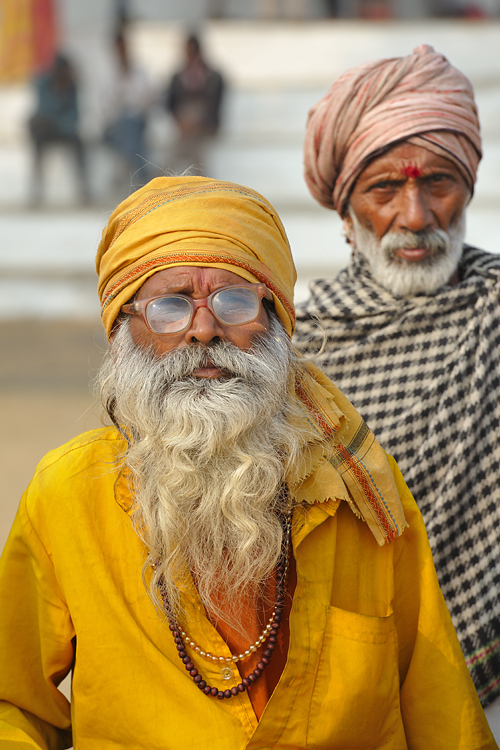 Since then, a dip in the Pushkar Lake and a prayer in this temple ensures redemption for the faithful. 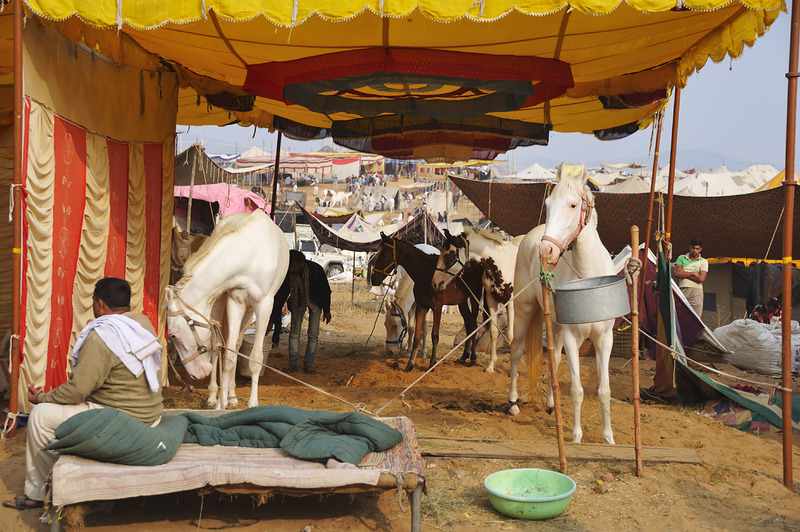 During the camel fair “Pushkar Mela”, hundreds of dealers and breeders gather on a huge, sandy and slightly hilly area on the outskirts of the city, and sell mostly camels, but also horses, bulls and cows - originally the fair started out as a common cattle market. 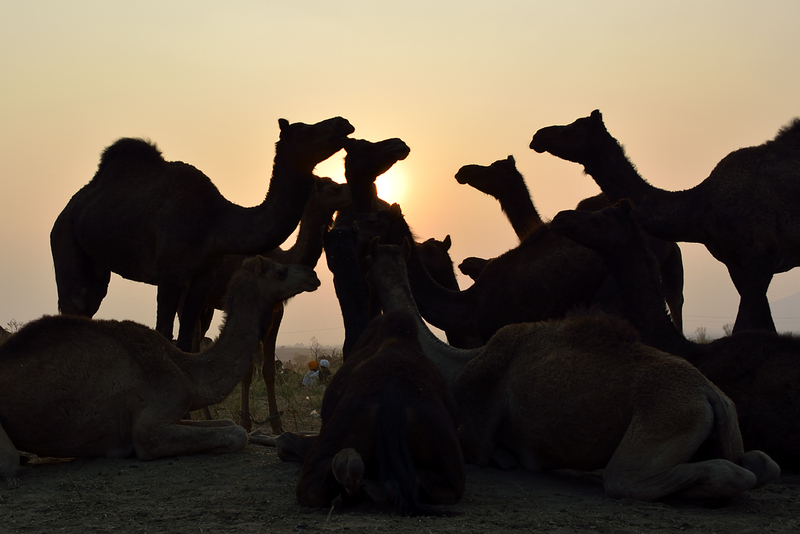 In the course of time, however, the category "camels" assumed massive proportions. 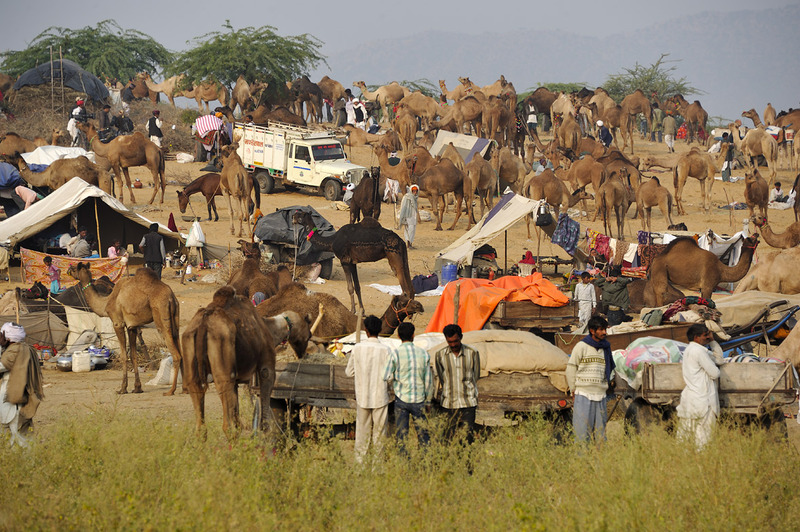 Over 20,000 camels, some even say 50,000 but that seems to me to be really exaggerated, from far and wide are brought and sold there. Through these two almost, simultaneously-occuring events, faith and commerce intermingle in Pushkar to form an inseparable whole; and what is, for Europeans, a contradiction, more likely represents the spirit of India on a small scale – a good opportunity, therefore, to get a glimpse into the country, as the small town of Pushkar transforms into a large, motley festival with the most colorful scenes and sounds. In the meantime, the camp is fully awake, the warming campfires are burning, animals and people are having their breakfast, the tea is boiling. 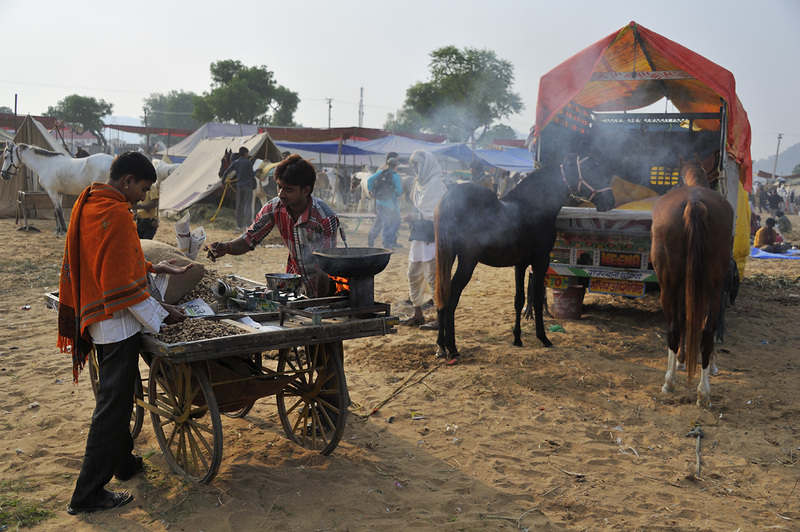 Since camel dung is normally used for the campfires – firewood being unaffordable for most – a slightly acrid smoke with a very distinct smell, wafts in the mornings and the evenings through the air. I see a few Asian tourists running around in a protective face-mask, as if in an operating room, but that is just plain uncool and seems a bit overdone to me. The bare, stripped-down, primitive ambience is impressive, almost overwhelming, but also very authentic, it has simply remained unchanged for a very long time. Almost everything takes place on the floor and there is – at least in this part of the camp – hardly any evidence of the modern, electrified and plasticized world, with the exception of the ubiquitous mobile phones, of course. 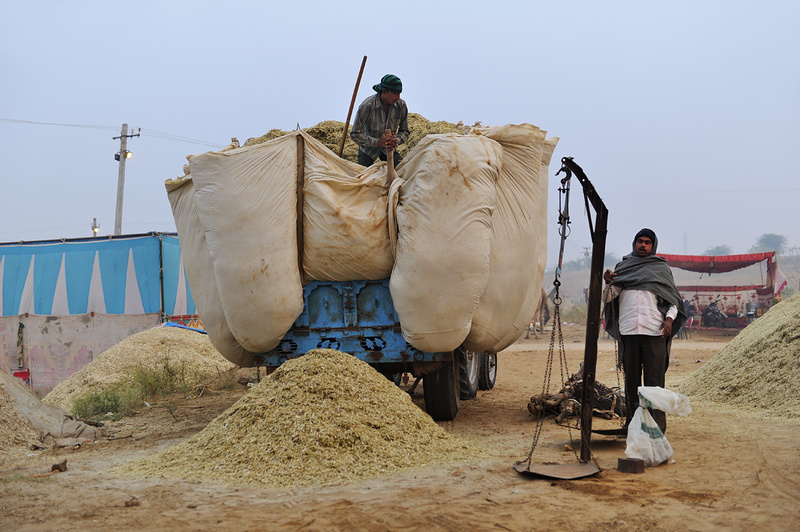 The smell is not unlike that of a huge cowshed, and you feel as if you are traveling through time. I feel a little like a character in the novel "The Time Machine" by H.G. Wells, except that in this case, it is a journey to the past. 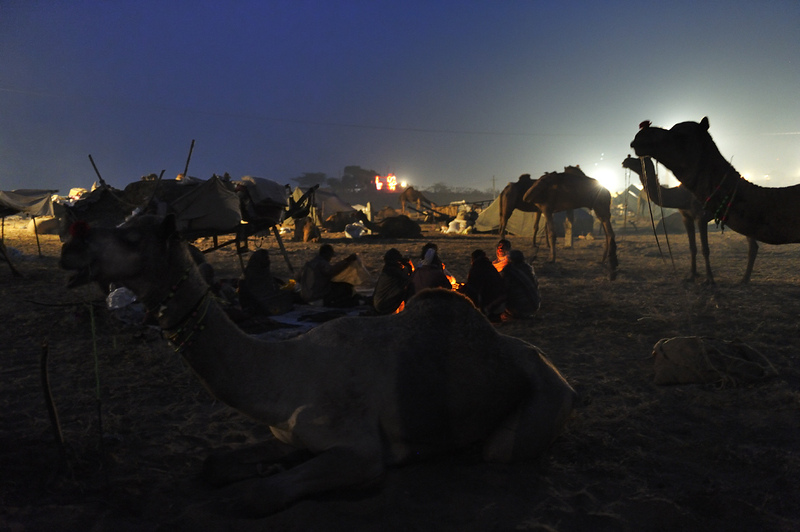 I marvel at the goings-on, the people, and how they have set it all up: wrapped up in blankets – the nights are cool, the days are warm to very hot, after all, we are here at the edge of the Thar Desert, also known as the "Great Indian Desert" – they sit around the campfire, the water brought to boil in charming metal pitchers, the tents are basic, some sleep directly under the open sky. 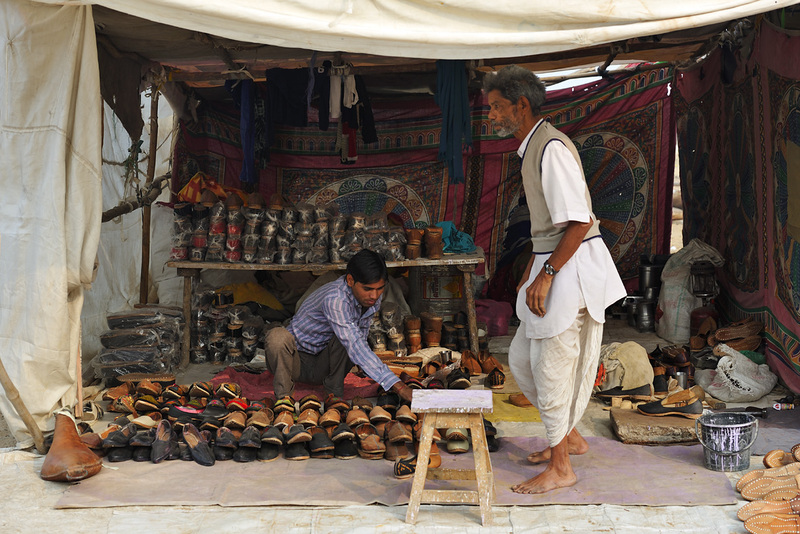 The nights are cold at the edge of the "Great Indian Thar Desert"
Right at the beginning of my tour, at the edge of the camp, I am greeted with a friendly “Which yourr cantrrie?” from the son of a hawker peddling plastic jewelry, frippery, trinkets and other such bric-a-brac. “Germany”. "Ohhh, veerry nice cantrrie, soo nice, soo bjutiful!". "Thank you" (~ ‘How would you know that?’). "Please come, visit my father shop, I will show you evrryting! No need buy, only luking ...!" He runs alongside me and is rather tenacious. As there is no way he is going to accept a clear-and-simple no – on the contrary, it would only appear to him as one of my wily negotiation tactics, and spur on his seller's pride – I attempt a friendly “Maybe later, OK?”. That works instantly, he hesitates briefly and goes: “OK, you prromised me!”. “No, wise-guy, I only said ‘may be’”. “OK OK, may be latrr”. He stops and smiles. 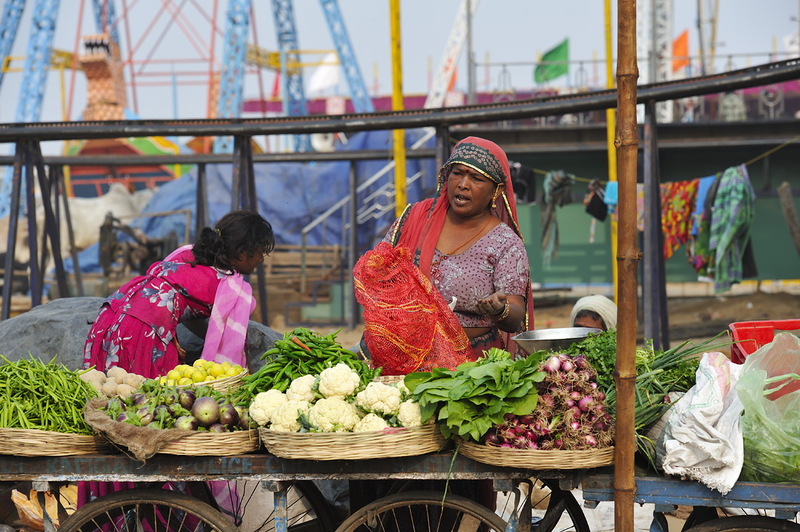 The hope of making a small sale must be allowed to survive, always! 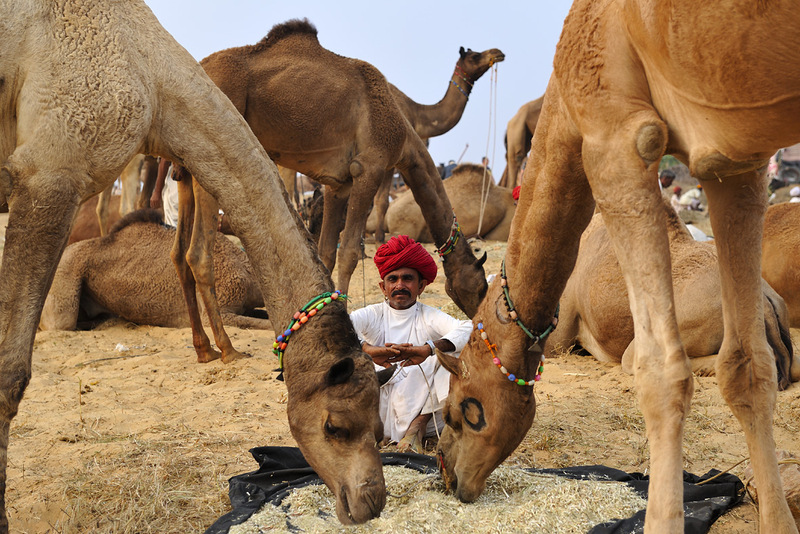 Everywhere the camels are munching hay, that was either brought along or can be purchased locally in desired quantities; some animals stand while chewing, but many prefer to lie down and eat comfortably; and thus slowly begins the first working day of the camel breeders and dealers. It consists mainly of one thing: waiting. And so they sit there on their own or in a group, between their camels, waiting for potential buyers, chit-chatting endlessly, drinking the obligatory tea (chai) and for a small fee, made clear by multiple internationally understood hand gestures, they also like to be photographed. 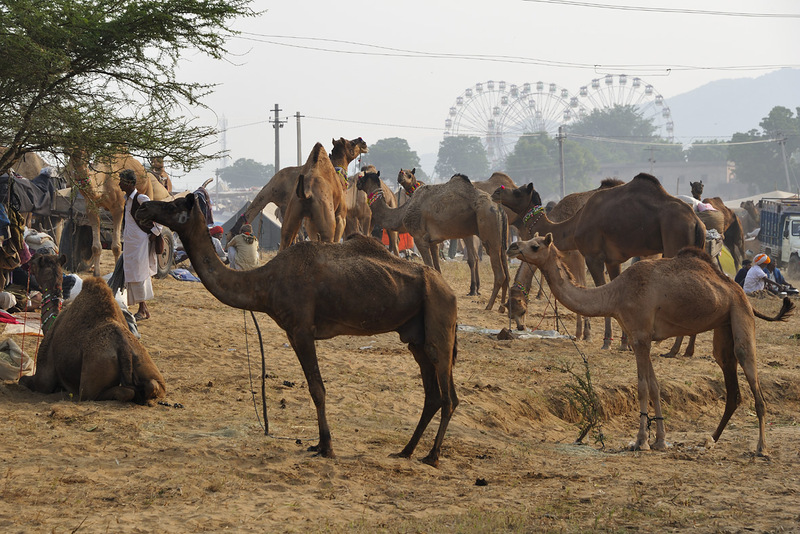 Even before the fair begins, all camels are washed and decorated with great care, many are sheared or painted in interesting patterns; specialized stalls offer camel jewelry in all sizes, colours and variations, from woollen bands, small mirrors, plastic bric-a-bracs to ornaments of silver and pearls, as well as silver bells and anklets for the fetters, which are very popular because they tinkle so beautifully, when the camels run. When potential camel buyers finally arrive, and the dealers put on an act of being uninterested, talk about this, that and the weather, including all possible non-business related small talk, but between the lines the real thing, the business dealing, the transaction is actually taking place. 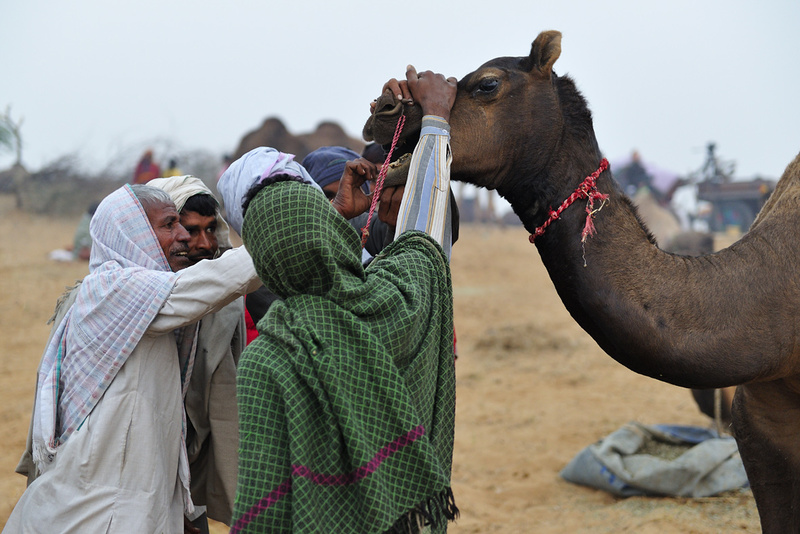 If the buyer shows interest, then the camels are presented; in case of a genuine interest, they are closely inspected. 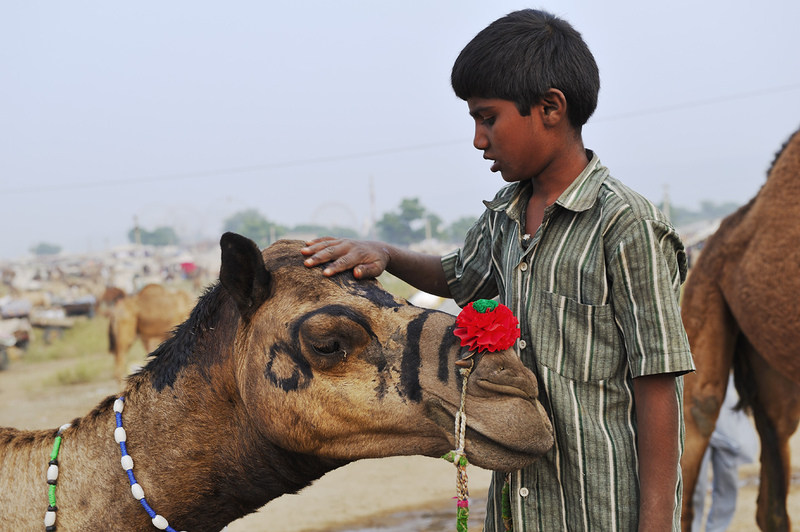 Most of the camels are quite docile, some are however rather rebellious, which makes the sellers visibly nervous! 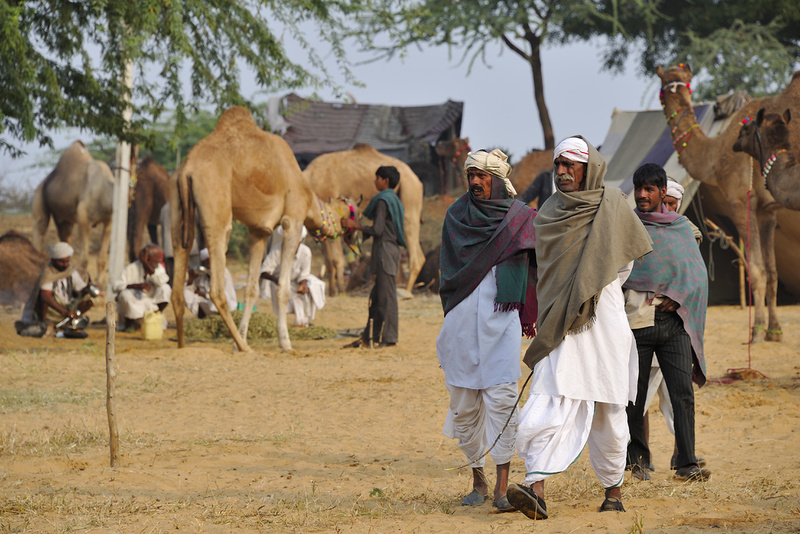 The camel buyers come closer! I absorb everything, and take photos with a delightful concentration, and with each passing hour, feel more and more comfortable, as I become familiar with the camels, whom I often end up pestering while taking photos, as I observe the entire colourful setting with a growing curiosity. With time, the photos themselves become more intense, more up-close. At one point, a camel scares me as it sniffs at me from the side with its huge head; I wince, which equally scares the camel, who pulls back in turn and we stare at each other for a moment, with big eyes and curious glances. 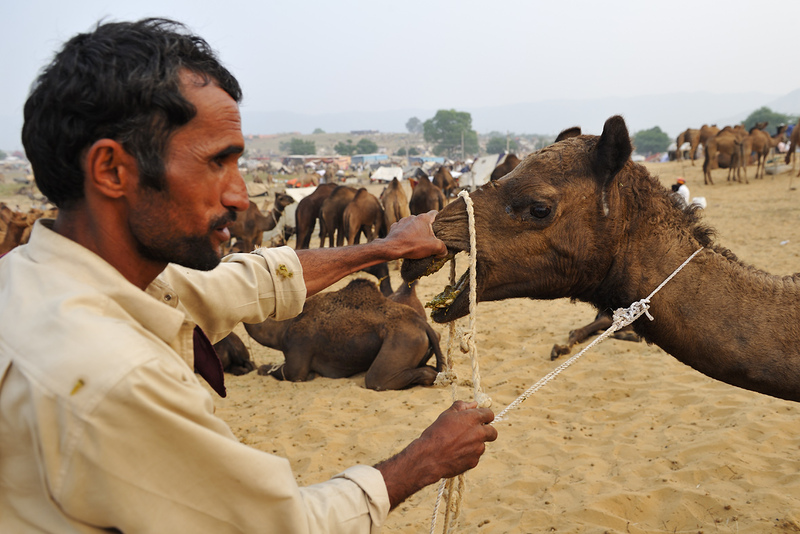 Our common reaction makes me very sympathetic towards the camel, mainly because it did not want to bite me at all! A scene at the watering trough astonishes me nevertheless, a young boy, standing on the edge of a wall, waiting for his camel, gently strokes it on the head, as the animal stands still, obviously enjoying it. I would have never expected so much intimacy from these animals! I move on further across the Camp Ground in the direction of the city. The closer I get, the more I get to see the full scope of the market. 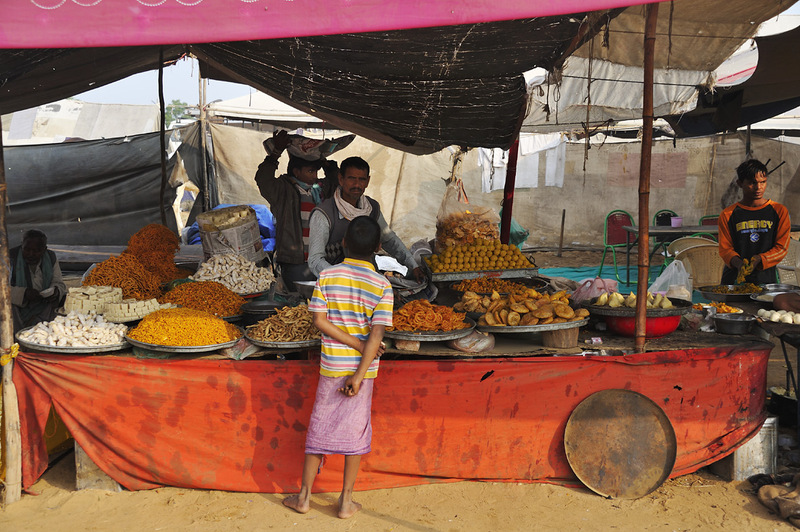 In the course of time, a huge funfair has developed around the Pushkar Mela and the Pushkar Pooja. 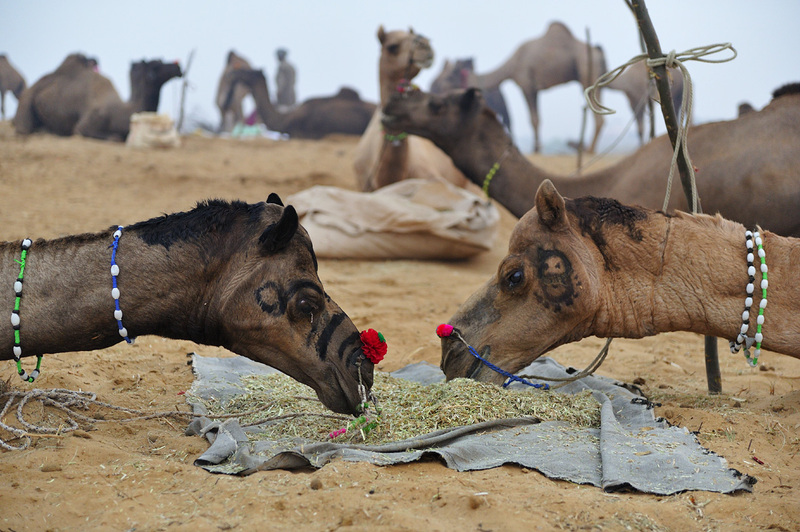 I would have never expected so much intimacy from the camels! 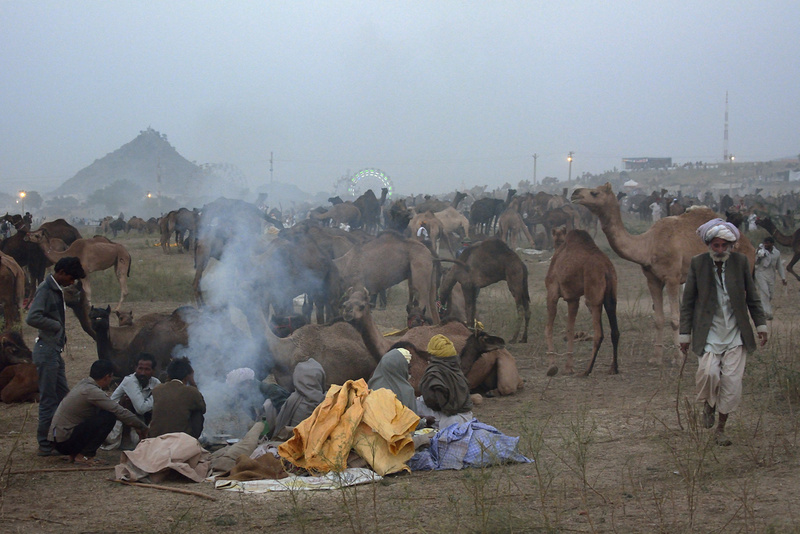 The physical well-being and the necessary flow of goods of all the camel breeders and traders, camel buyers, gawkers and tourists in the camp, are looked after by tea and take-away stall owners, who have travelled here specially for the camp, vegetable sellers on carts or in hastily set up tents, grocers without stalls or tables, who simply pile their fruits and vegetables on the ground, wandering peanut-, camel dung- and camel feed sellers, camel jewelry vendors, cigarette and what-have-you smugglers, as well as a flying shoe-maker in his beautifully decorated tent. 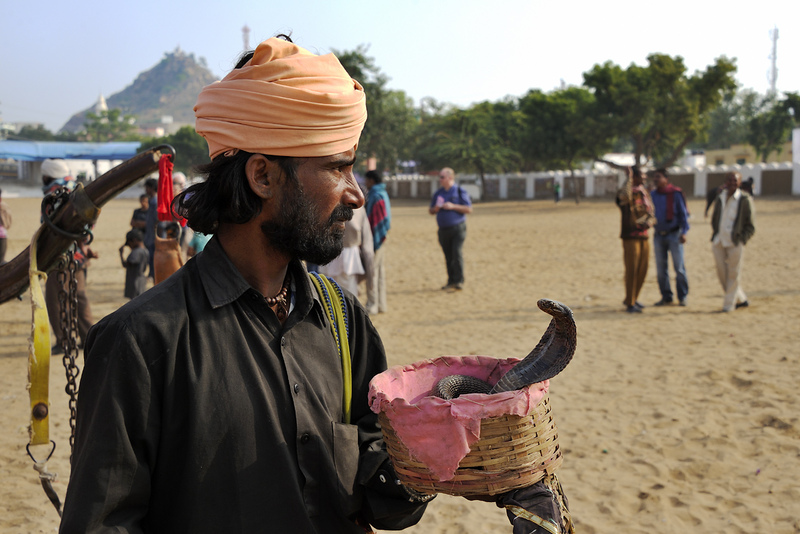 And amongst all the entertainers such as tightrope walkers, traveling sitar players, magicians, itinerant preachers, snake charmers, dancers and circus performers mingle countless tourists and photographers; the first sadhus, a type of monk, are already arriving for the holy festival Pushkar Puja, and so are pickpockets and quacks, beggars are anyway always present, now they have simply become more in number; cows in search of something edible trot along undeterred as always through the motley crowd, and the pigs and goats running around do not attract attention at all. 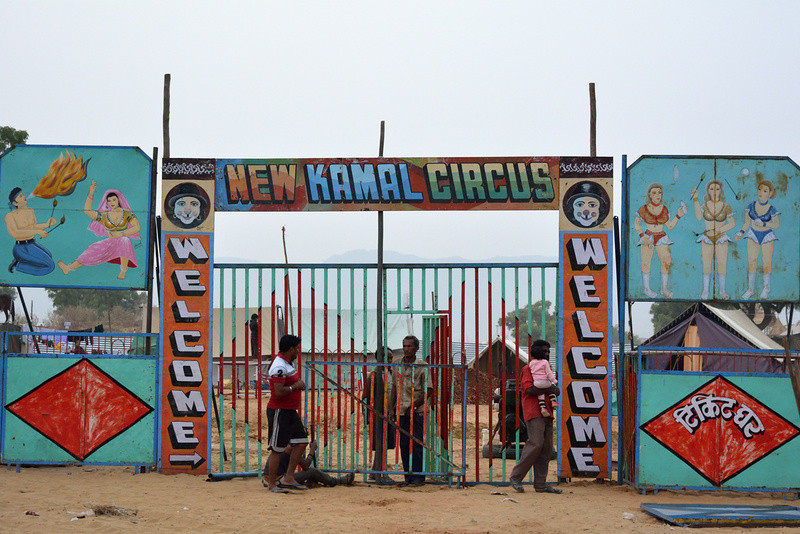 For the entertainment of all, there are fixed installations such as three Ferris wheels, which are still being busily bolted and worked upon on the first day of the fair, swinging ships, the “New Kamal Circus” which is yet to be built, two fully loaded hot air balloons, information stands of various government agencies, in addition to which, Indian “Mantra music” from rattling, tin loud speakers trickles all over the entire facilities and the city; camel cart taxis transport people who can afford a few extra rupees from A to B; or simply around in a circle: the tourists.